Recent scholarship has vanquished the traditional perception of nineteenth-century Britain as a musical wasteland. In addition to attempting more balanced assessments of the achievements of British composers of this period, scholars have begun to explore the web of reciprocal relationships between the societal, economic and cultural dynamics arising from the industrial revolution, the Napoleonic wars, and the ever-changing contours of British music publishing, music consumption, concert life, instrument design, performance practice, pedagogy and composition. Muzio Clementi (1752–1832) provides an ideal case-study for continued exploration of this web of relationships. Based in London for much of his life, whilst still maintaining contact with continental developments, Clementi achieved notable success in a diversity of activities that centred mainly on the piano. 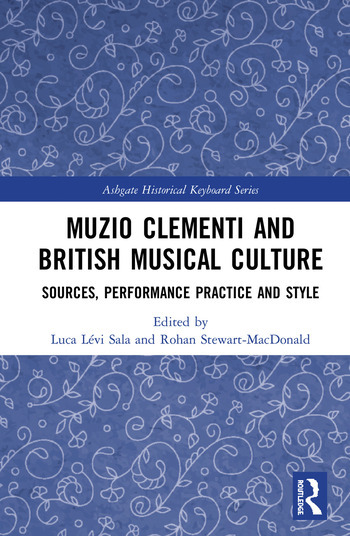 The present book explores Clementi’s multivalent contribution to piano performance, pedagogy, composition and manufacture in relation to British musical life and its international dimensions. An overriding purpose is to interrogate when, how and to what extent a distinctive British musical culture emerged in the early nineteenth century. Much recent work on Clementi has centred on the Italian National Edition of his complete works (MiBACT); several chapters report on this project, whilst continuing to pursue the book’s broader themes. Luca Lévi Sala is a Professeur associé at Université de Montréal. He was Visiting Researcher at New York University in 2017 and Visiting Research Fellow at Yale University in 2015–2016. He has published in the Journal of Musicological Research, Notes, Revue de musicologie, Eighteenth-Century Music, Studi Musicali, Rivista italiana di musicologia, Ad Parnassum Journal, and Analecta musicologica. Articles about Clementi are forthcoming for Oxford Bibliographies Online (OUP) and The New Grove Online (OUP). Member of the Board of the Italian National Edition of the Complete Works of Muzio Clementi (MiBACT), he has edited the critical edition of the Concerto for Piano and Orchestra Op-sn 30 (Bologna, 2012) and, together with Rohan H. Stewart-MacDonald, the critical edition of the ‘Viennese’ sonatas Opp. 7–10 (Bologna, 2018). He is now preparing the new Thematic Catalogue with Updated Bibliography for Each Work, Documents and Iconography Relevant to Muzio Clementi’s Life (Bologna, Opera Omnia, Italian National Edition, vol. XV). Rohan H. Stewart-MacDonald studied at St Catharine’s College, Cambridge, between 1993 and 2001. Since completing his Ph.D. he has specialized in British music of the eighteenth and nineteenth centuries, publishing the book New Perspectives on the Keyboard Sonatas of Muzio Clementi in 2006 (Quaderni Clementiani series). In 2012, with Roberto Illiano, he co-edited and contributed to the multi-author, multi-lingual Jan Ladislav Dussek: A Bohemian Composer "en voyage" through Europe (Bologna, 2012). In the last few years, his academic interests have diversified, to include topics such as mid-eighteenth-century Italian symphonism and the early nineteenth-century virtuoso concerto (both piano and violin). Stewart-MacDonald also performed regularly as a pianist. Member of the Board of the Italian National Edition of the Complete Works of Muzio Clementi (MiBACT), he recently edited, together with Luca Lévi Sala, the critical edition of the ‘Viennese’ sonatas Opp. 7–10 (Bologna, 2018).